Thanks to the fast-changing world of technology, there is an alarming number of smartphone apps that protect homes and keep them safe from potential crime. They provide you with the ability to monitor and protect your home while you are away. Many are available as a free download to your phone. Make sure you know if you are required to pay for their services or signup for a contract with the company. 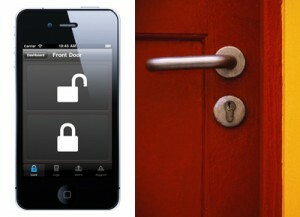 People who use these apps will have their home’s security at their fingertips at all times. They can activate their home security system or wireless office with the touch of a button from anywhere around the globe. Instead of feeling as if you have no control over the safety and security of your home, you can remain confident that everything is taken care of. Before apps were introduced, homeowners would use a handset, security system consoles and a keychain remote for controlling the system. Systems could all be monitored and controlled through the Internet. Thanks to the advanced security apps, you can even be on a cruise ship out in the middle of nowhere and arm or disarm their security systems. You can use these apps to take photos though the surveillance system. From across the globe, you will be able to see who or what is on their property at any point in time. Depending on the type of system you have, you can adjust the lighting inside and around your home. You also have the option of closing and opening your window shades. This provides your home with the appearance that someone is inside, which will keep burglars at bay. There are other apps that allow the homeowner to turn the television or stereo system on or off. Advanced apps are programmable to adjust the thermostat inside of your home as well. If the person has been away for a few days and the weather has taken a turn, you can use the app to adjust the thermostat accordingly to make it warmer or cooler. Depending on the app, some are able to secure the property without needing Internet service. However, advanced security apps require Internet access for them to properly work. Depending on your particular situation, it might not be necessary to incorporate all of the different features into your system. There are a few components that you need to make sure you understand with your new security system. The heart of the security system is the control panel. You program your system through a keypad attached to the wall. Besides the aforementioned smartphone controls, some of the newer models will let you program the system through a wireless remote control. Thanks to a two-way speaker system, you can communicate with the monitoring service when the alarm is activated, which is a nice bonus. Sensors can be mounted on windows and doors. They work along an electrical circuit that will trigger the alarm if it is interrupted or broken. Install sensors on all of the downstairs windows and doors, as well as any upstairs windows that are prone to attack. Motion sensors help monitor movement inside of the home. Various options are available from which you can choose, but the PIR tends to be one of the most popular choices on the market today. It can detect changes in the temperatures within a specified room. Pets are not an issue for this sensor because they tend to have lower body temperatures than people do. Power supplies with batteries are ideal for when there is a power outage. Just because the power goes out, that doesn’t mean your home should be left unprotected and vulnerable. Systems equipped with cell phone backups can alert the proper authorities when your phone lines are cut or down. If you want the added reassurance of knowing the police department will be there immediately at the sign of trouble, monitoring services, might be something you want to look into for your home. Even though many people overlook this component, yard signs are an important part of your security system. Window stickers and signs let burglars know that they are putting themselves at risk if they try to gain entrance to your home. Most of the time, signs around the property are enough to make anyone run away and look for other properties that are less protected. There are some other options that you may want to consider installing with your system as well. Detectors are able to monitor for carbon monoxide, smoke and heat to alert your loved ones to any potential dangers.